My husband and I stayed at this hotel the last two weeks in August. We arrived at the hotel about 11pm and there was a bottle of red wine, a basket of fresh fruit and a fresh flower arrangement waiting in our room. All the rooms are sea view, from where you can also see the old fort, the Greek mainland and Albania. 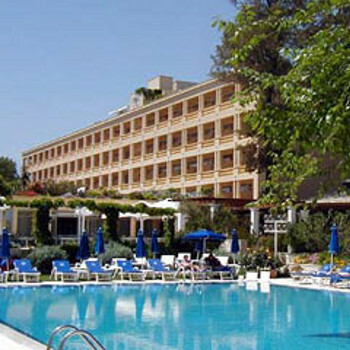 The location of the hotel is excellent, about a 10 min stroll into Corfu Town and is a peaceful oasis compared to the noise and bustle of the town. The room was a good size with antique-style furniture and a double bed which I had requested. I also recommend you request a high floor as I suspect that the rooms on the lower floors may have limited views (we were on the 4th). There is loads of hangers and wardrobe space and although the bathroom is a bit small, its perfectly adequate. The bed linen was changed every day as were the room and pool towels and we had a small vase of flowers in the room every day. The mini-bar was expensive, 3 euro 20 for a small bottle of water or lemonade. The breakfast at this hotel is fantastic - something for everyone. It includes fresh croissants and danish pastries, various meats and cheeses, tomatoes, cucumber, various yoghurts, cereals, breads and jams, pancakes, fresh juice including orange, grapefruit and peach, a toaster, capp/latte machine, a fresh orange juice machine and a variety of hot food including eggs (boiled, scrambled etc), bacon, sausages and mushrooms. You have a choice of sitting outside or in. We had our brekkie about 9am - it was never busy and there was always a good choice of tables. The pool area and garden areas are fantastic - it is so quiet and again never busy. This is not a hotel for those with children of any age - there is nothing for them to do. The hotel frowns on the use of airbeds and balls in the pool. If your ideal holiday is rest, relaxation, peace and quiet with no children running around, then this is the hotel for you. There was never any problem getting a sun lounger and each pair has a brolly and a table. The pool bar is good also - the beer and wine is approx the same price as in town but the water is seriously over-priced at 3 euro 20. You can buy 4 bottles for the same price in one of the kiosks in town. The snacks menu is good with prices ranging from 6 euro to about 20 euro with good portions. We mainly had toasties, club sandwiches, burgers and fries and omlettes. The hotel has a manager's cocktail hour every Tue from 7-8pm. Tip - the "cocktails" are like water so its better to have something else like wine or beer which is also complimentary. The manager makes a point of talking to everyone. There is a BBQ night every Thur with entertainment but was a bit pricey at 45 euro a head. The staff at this hotel are friendly, efficient and helpful from the manager to the cleaners. The indoor public areas are immaculate with fresh flower arrangements everywhere. In all, I would recommend this hotel to anyone but not for those with kids. The clientel seemed to be mainly Greek and English with an age range of mid 30's to 90's and quite a few had stayed at the hotel before. It is listed in the brochures as five star but it is more like a good four star. Having said that however, the staff, pool area, breakfasts and location of this hotel are definately five star. Although we had no complaints about the hotel (apart from the pricey water) and would stay there again, I don't think we would spend another two weeks in Corfu town.